A completely private and secluded, self-contained cottage set high in the hills, overlooking a lush grazing valley and forested National Park. Wallaby Creek is a cattle and forestry property of 500 acres, managed for production, conservation and self-sufficiency. The valley is well-known for its wildlife, especially birdlife and the families of kangaroos and wallabies that graze to the cottage doorstep. The cottage is comfortably appointed for one or two couples, with two queen size bedrooms. It has a fully equipped kitchen, solar and gas power, a bathroom and a verandah with stunning views. Wood for the glassed-in fireplace and linen are provided. Wallaby Creek is close to waterfalls, rainforest walks and small towns of Urbenville, Woodenbong and Killarney. We’ve made the tariff so reasonable that you’ll be able to stay a while (eg $400 for 6 or 7 nights), $200 for two nights, and $60 for each additional night. Longer stays are welcome. Because we love living here, and we’d be happy to share it with you, we keep the tariffs low. 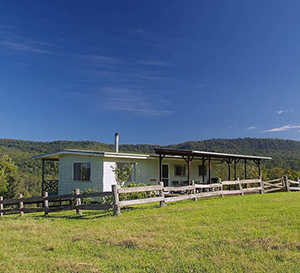 Wallaby Creek Cottage is ideal for romantic weekends or weeks, family time, walking in the bush, exploring the creeks and bird species, relaxing on the verandah, cooking up a storm for special company and complete peace and quiet. We are located in northern NSW, an easy two and a half hours drive from Brisbane or Byron Bay and two hours drive from Toowoomba. It is a place to be nourished, relaxed & inspired. ph 02 6634 6166 You need to book direct either by phone or email. When contact is made, address directions will be given.